Things go awry when Batman shows up, and turns out to be one of two Batmen. The fracas that occurs results in the containment system for Regime Superman being disrupted. Needless to say, Regime takes advantage. Story - 4: I have to admit that by the last page, I do want to read more. The mystery of the second Batman is pretty easy to sort out, though I won't give it away just yet, however, my interest lies in seeing Regime Superman once again under the hand of Tom Taylor, who was able to make him a compelling villain, which was the only point of interest that maintained me throughout the first Injustice series. The rest is more of the trifling claptrap, which amounts to DC Universe light. The return of Green Arrow and Black Canary for no reason other than "just because". Harley Quinn is still around when she should be as dead as her puddin'. The vs-battle mentality that turns viable characters into comic cannon fodder... though the scene with Calendar Man was humorous. Still, Taylor knows how to write a serial better than most, and I do want see more of Regime Superman, the introduction of Supergirl, and other heretofore unseen characters. It won't stay my critical hand for malarkey, but I have to enjoy the moments when Injustice is an entertaining diversion, as opposed to something that makes my blood boil. One more thing, the new game is also a lot of fun, on platform or mobile. Have a go at it, you just may like it. Art - 3: The art is serviceable, and I wish I could say more than that. There are a lot of factors in making Injustice, which leave the artwork less than it could be, but I would love to herald an issue here or there, rather than the "OK" which most garner. 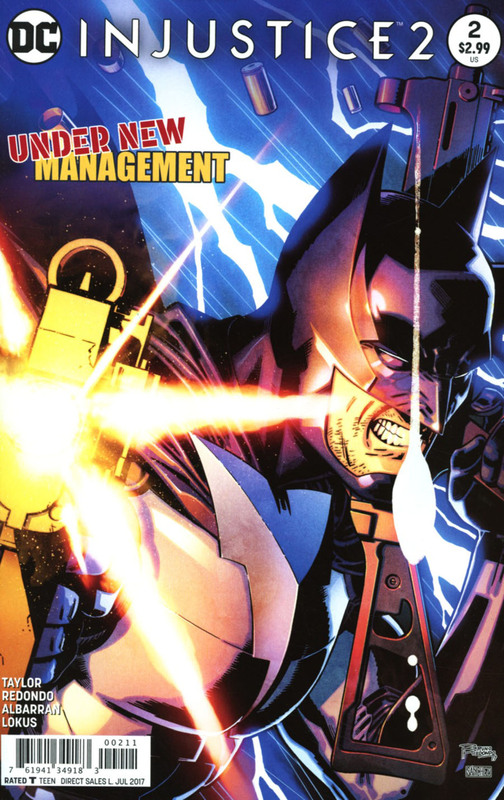 Cover Art - 3: Batman with a gun! And stubble! He must be... EVIL!